Deciding exactly how far you should go when writing dialogue is a dilemma, particularly if you are writing for a yet undetermined audience. You want to keep it authentic, but refrain from offending potential readers. What’s the answer? Having spent my formative years (until about age 8) on a sheep ranch in Wyoming that my father was managing for his three bachelor uncles, I was totally familiar with a well-aimed curse–usually not at a person other than something mild like, “When in the hell are you going to get that fence fixed?” Generally it was a piece of farm machinery, a recalcitrant ram, or the gumbo that mired the truck. That is, until it was time for me to start school. I lasted one morning in school, answering every question I was asked, including my name and age, with an adjective or adverb that the lovely, elderly teacher–who for years had maintained serene control of her class room–had never experienced. I was escorted home in the afternoon; my shocked parents were told to clean up my language before I would be readmitted; Uncle Bill thought his joke was the best he’d ever pulled, and it took my mother a full week to deprogram me. It was not completely successful, but I have managed some restraint in my writing. So, what is too much? What is not enough? What is authentic? What is offensive? What is gratuitous? Some of the characters in my short stories and novel curse: some do not. A wisecracking hairdresser, a frustrated father, a woman who has exploded with hurt and anger cusses out the man who hurt her. My guide is circumstances and what would be a natural “voice” for my character in those circumstances. That’s the fine line a writer has to walk. What is authentic and what is gratuitous? We all have a definition, depending on our upbringing, our values, the image we wish to project. My time on a sheep ranch, and later visiting on other ranches, inured me to finding “language” offensive; however, like anything else, the situation dictates the response. Most of us differentiate our behavior depending on how solemn or rowdy the occasion warrants. So must our characters. It would seem unusual for a character, regardless how constrained and conservative, to utter, “Goodness, I believe I just injured the digit on my left hand,” when the jack just slipped and he smashed his finger. Or to have a driver utter, “My, my, that car is coming straight at me,” before a collision. You can supply the more typical responses. It all comes down to knowing your characters, gauging their typical responses, portraying their level of emotional involvement, and keeping their dialogue real. Note: Uncle Bill is somewhere laughing his . . . head . . . off. Do you have a completed manuscript in the desk drawer? Sitting in a file on your computer? Handwritten in a notebook? Did you write it five years ago? Ten? Twenty? Did you try to get an agent or a publisher to read it? Then, when the lack of response became too depressing, did you go on to another project? Take up watercolors? I’ve experienced all the above (watercolors were a failure). I currently have two manuscripts that, while I believe in them, probably don’t fall into commercially recognizable categories. One is a limited biography of an ordinary couple in extraordinary circumstance; the other is a novel I wrote in the 1980s. The novel almost made it, if I’d been smart enough at the time to know that a personal letter from a top publisher–with suggestions–was a rarity. But I was very busy with my job, and I couldn’t face rewriting (and retyping 325 pages on an electric typewriter). If I’d had a computer then, it might have been a different story but . . . that’s history. Still, although I’ve written other books, short stories, and essays with some success, those two books beg for another chance. Maybe it would be worth all that rewriting and typing now. Why? A Peony’s persistence has made its mark. Last September, I cleaned out a ragged, overgrown space next to the deck, clearing the area of weeds and out-of-control monkey grass. Near the middle was a once lovely Peony plant, but the blooms were long gone, the day was hot, and I was out of patience, so I hacked it down and dug it up along with the grass roots–or so I thought. This spring, while spreading a new layer of cypress mulch, I was surprised to see that a portion of the plant had survived–underground, throughout the winter–and sent up one stem with a half dozen leaves. Wisely, it had sent the stem outside the brick edging I’d installed. 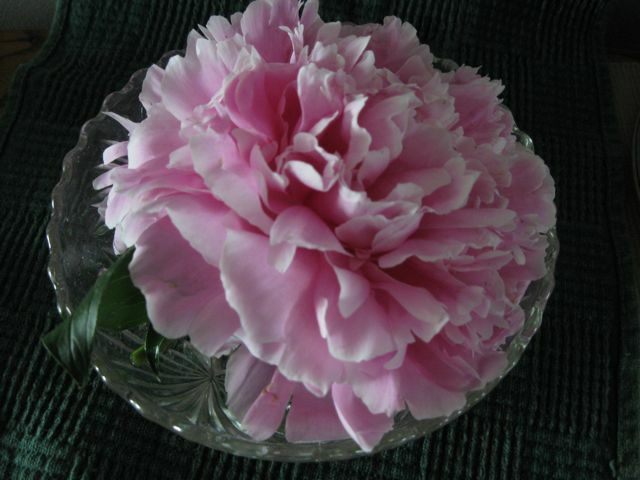 And on that stem was one incredibly gorgeous pink Peony bloom, large as a plate and perfect in every way. I’m not sure if that one exquisite flower was a reward or a remonstration, but it made me think about writing and how easy it is to give up on our work if it doesn’t get the desired response. So, I’m going to dust off those manuscripts and take a good look at them. Maybe, just maybe, one of them will turn into a perfect bloom. “It was our first full day in Rome. Jo and I sat at a tiny, outdoor table, nibbling on slabs of Pizza Margherita. The pizzeria was located in a cobbled-stoned alley near the Via del Corso, a neighborhood of small hotels and great shopping. “What is that strange noise?” Jo asked, washing down a bite of pizza with her cola. This was how I began an account of a trip I took with my good friend, Joanne, a few months after I learned she had a serious illness and wouldn’t be taking any more trips with me. I wanted her to have it for the memory; but mostly, I wanted to make her smile. My friend, Jo, was a flight attendant. We were flying “space available” to Rome. Although we were listed, and the plane wasn’t fully booked, someone might come along with more seniority. So, bags packed, we met at the Dulles airport in D.C. I’d taken two flights from Kentucky to meet her, and she’d flown from the Pacific northwest. Since we weren’t sure of the flight, we’d decided if we couldn’t get the flight to Rome, we’d go somewhere else. Maybe Frankfort. Maybe France. But, we would have a trip. We had euros; we had our passports; we had two weeks. It seemed enough. Recently, I was talking about writing to a young man in my family. He has spent an incredible year abroad: teaching in Thailand, trekking in Nepal, walking the Camino de Santiago in Spain. He’s planning to write about his year, but told me he’d inadvertently lost his Nepal notes while bicycling in Paris. We discussed how he might begin his book. As I wrote, and assembled remembered scenes about my trip with Joanne, the theme and title became obvious: Tuscany Without A Plan. Although I hadn’t taken notes on the trip–I was two busy driving our rental, 6-speed manual transmission Fiat and trying to keep us alive in traffic–I found it wasn’t hard to recreate our trip with the help of several maps, hotel and restaurant receipts, and a travel guide that would remind me of the correct names and spelling of the places we’d visited. It’s really all you need; the humor, travails, joys and descriptions will not desert you. The people you met will come alive in your pages; the streets will invite you to walk them again; the sunset will thrill you anew. Note: Long time between posts: A book fair, a workshop I presented on Oral History and the Art of Creative Eavesdropping, and a family medical issue has eaten up time. I promise to do better.